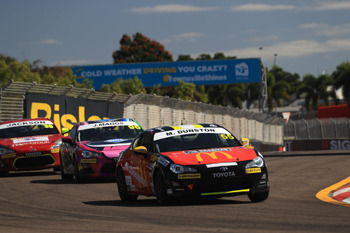 The T86RS is an affordable, grassroots race series designed for drivers with the passion and talent to compete at a national level and is run alongside select rounds of the Supercars Championship. Born and raised in Townsville, North Queensland, Madison Dunston is the fresh face of Australian motorsport. Starting her karting career at just seven years of age, Madison has utilised her three generations of family motorsport heritage and now at 19, she is proving herself to be a competitive and highly respected young professional. Motorsport does not differentiate between male or female and Madison has held her own consistently amongst her male and much, more experienced counterparts. With a passion for driving, Madison's ambition is to become a leading V8 Supercar Driver and to become a role model for aspiring female drivers who share her passion for this high adrenaline sport. Question: How does it feel to be one of Toyotas first ever female competitors in the T86 Series? Madison Dunston: To be one of the many females that have raced in the T86 series is such an incredible feeling! It's making history and to say that I have raced them is amazing! Question: What inspired your passion for racing car driving? Madison Dunston: I first started Go-Karting at the age of 7, so twelve years ago, now. I was 16 years old when Dad and I made the decision that it was time to step up into racing cars. After such a successful nine years in karting, Dad knew I had the talent to step up. Question: How do you train for an event like the T86 Series? Madison Dunston: Before every race I like to train 3-4 times a week which includes core exercises, simulator and time reaction training. Doing these things, improve my ability in being quicker and stronger when racing. Question: What's involved in an event like the T86 Series? Madison Dunston: The T86 series and many other categories, we are involved with the supercars events, which are televised on FOX Sports. Question: How do you overcome the challenges associated with being a female in a male dominated sport? Madison Dunston: I wouldn't say there are many challenges, us girls that race is treated equally with respect no matter the gender. Males do tend to me stronger than us girls, but we have the brains and speed to beat them (laughs)! I have heaps of fun racing with the males but beating the boys is well over done in my racing goals (laughs). Question: Can you tell us about the car you drive in the 86 Series? Madison Dunston: The car is a Toyota 86 with a Boxer Engine, two-door coupe and can get up to just about 200km/hr! It is super fun to drive, definitely different to my Aussie car but motorsport is all about learning! Question: What message do you have for aspiring female racing car drivers? Madison Dunston: Get out there - in a Go-Kart, put on your helmet and get that feeling of adrenaline! It's the best thing I ever did and I would never go back! Just because you're a female does not mean you can't play in a male dominated sport! What inspires me is to look up to other female drivers and look where they have gotten to; we can do it! Question: What's next, for you in terms of racing car driving? Madison Dunston: I'm going to finish off the season in the Aussie racing cars and hopefully achieve a top ten finish in the championship! Next year not too sure what the plans are, I am looking for more sponsorship to see where I could go!